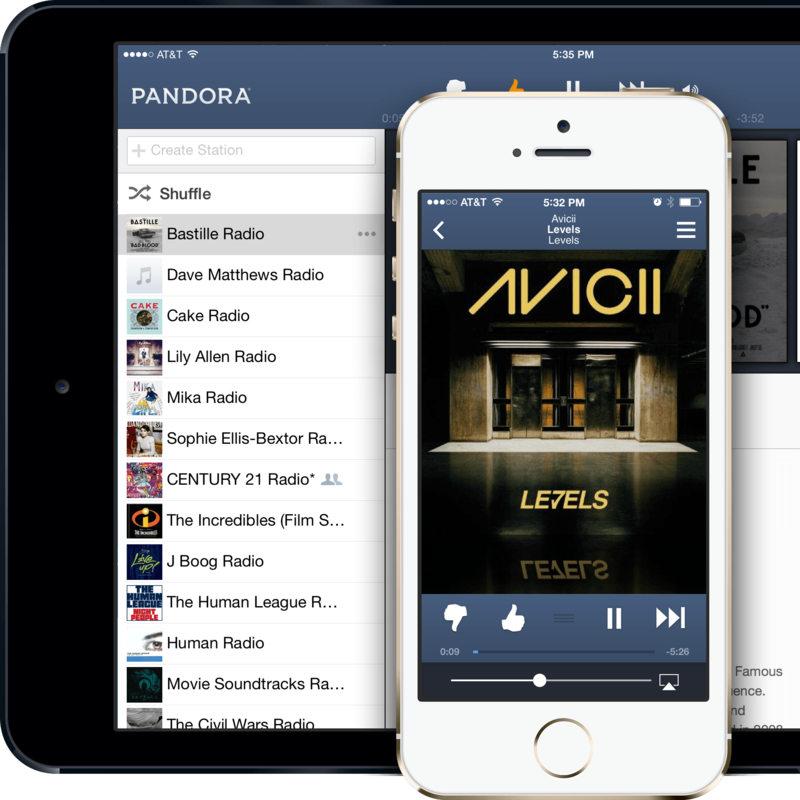 Pandora is a streaming radio service available for both the iPhone and iPad (not to be confused with on-demand style music locker services). Pandora focuses more on music discovery and curation. For folks who don't like to listen to the same things and prefer a more traditional radio like experience, Pandora is one of the best options currently available. By liking or disliking songs, Pandora gets to know your tastes and will play music that it thinks you'll enjoy. The more information you give Pandora, the smarter it gets. Basic radio streaming through Pandora is completely free. You can create up to 100 radio stations based on your favorite artists, songs, and albums. The basic model of Pandora is also ad supported and only provides so many track skips at a time. Pandora's paid subscription model, Pandora One, currently costs $3.99 per month. Paid subscribers enjoy an ad free experience along with even more skips per hour and unlimited stations. Other features of the Pandora for iPhone and iPad app include bookmarks which allow you to save tracks you really like so you can either purchase them on your own or start a station based on them. You can also tell Pandora when you're tired of a track so it doesn't keep looping it into a playlist you're listening to. Apple recently released their own radio streaming service, iTunes Radio, to compete with offerings such as Pandora. Both services focus on providing a curated listening experience while encouraging users to actually buy the content they like instead of rent it, which is what services such as Rdio, Spotify, and Beats Music offer. Aside from providing a universal app for both the iPhone and iPad, Pandora also provides a free Mac app for Pandora One subscribers, web listening, integration with Sonos, support for the Pebble smart watch, and integration with many more platforms and services. Alexa turn up the jams! Amazon Music Unlimited, Amazon's music streaming service, is a great music streaming option that's even better on the Amazon Echo. If you've got an Amazon Echo and want to give the music streaming service a shot, here's how! Sit back, relax, and watch music videos with your Apple Music subscription! Which streaming music service should you get? With so many choices now, it's difficult to decide where to put your money. Here's some advice. Apple has launched a global music publishing division, selecting Elena Segal to run it. Though you can't control playback using HomePod, you can play any audio from your iPhone or iPad to HomePod, including Spotify and even Amazon Prime Music! So many music streaming services that it's hard to figure out which is the right one for you? Well, here are some of our favorites! Looking for the best services to stream your favorite tunes? Here's a roundup of our top picks. Looking to better commune with the environment this spring? Here's a playlist with a nature theme that will hopefully help you appreciate the world around you in all its complex and awe-inspiring majesty. In addition to the announcement introducing the new head of Apple Music, the streaming service officially hit 40 million paid subscribers this week. Starting Christmas Day, Tidal will give away its music streaming services for 12 days for free — no credit card required! Sprint is offering new and existing customers who enroll in the free 6-month TIDAL HiFi subscription a free ticket (up to 2 per account) to Jay-Z's upcoming "4:44" Tour at select stops. If you're enjoying Tidal or thinking about signing up, here's an important message on how you should pay for it. The App Store is easy, but it's also costing you a lot more. How much mobile data does streaming media use? Here's the breakdown on how much data streaming music and video use so you know how much to budget. Pandora Premium — Everything you need to know right now! Pandora’s officially entered the music subscription game. Here’s everything you need to know about Pandora Premium. Don’t want to get charged for your Pandora Premium trial — or don’t want Premium at all? Here’s how to cancel.